Prepare a will. A majority of people die without one. You lose control over the disposition of your possessions without a document. Leave a gift through your will to your favorite nonprofits. Leave a percentage or a specific amount. Help increase the number of people who remember charities in their will, currently under 10%. Bequeath to charity especially assets that trigger income tax on your estate, like an IRA or pension plan. This type of asset is not only subject to income tax, but estate tax as well. Your loved ones may end up with only 30% of the face value. Nonprofits will get 100% because they are tax exempt. Name a nonprofit organization as the beneficiary of a life insurance policy you may no longer need. Encourage family and friends to remember nonprofits through their wills. 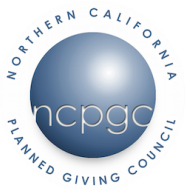 If you would like to give a gift to the Northern California Planned Giving Council, please contact us at info@ncpgcouncil.org.